Summer apple rings – Delicious anytime of the day. I am just loving this Mediterranean weather even though I spend most of the time perched under a parasol *redhead, however long may it continue? I say this of course whilst firmly crossing my fingers and toes! With the sun held high in the sky, we all anticipate our partners taking control and lighting the BBQ for that unexpected, aromatic, unburnt, impromptu BBQ dinner!! Hooray mum’s night off!…. I on the other hand am in charge as normal of ensuring we have plenty of delicious sides to accompany the BBQ as well as enough wine and bubbles chilling in the fridge. When the sun peeps through the children are pulled away from their electronic devices and urged to run wild and play, play, play, well the younger children of course. There is nothing that I love more than to hear the sound of my children playing in the garden with their footballs, bouncing on the trampoline, Chiara singing into her microphone and Santino launching water bombs at everybody , but rest assured I’d be shouting at the top of my voice, ‘Don’t you dare wet me’ . Roll on summer and lazy weekends…. With an almost instant change of season we welcome a change of produce. My favourite summer vegetable has to be the courgette with its stunning flower as well as the humble heritage tomato and seasonal fruit, well I simply adore berries. British seasonal berries are now in season and they provide a perfect snack especially if they are selected as part of a mixed fruit salad, dropped delicately over mum’s famous Sunday trifle or simply skewered and dipped into melted chocolate, YUM. As the school term end approaches the children we be off school for around 7 weeks! Love and fear immediately take hold of my heart. How will I keep them fed and happy for 7 weeks? They turn into grazers and just love to constantly eat. It’s exhausting. I am constantly asked by my children ‘What can we eat now?’ …. I mean every 5 minutes or so! So here is my little go to treat. If I’m honest I probably love them more than my children. My anytime dried apple rings are honestly just so moreish, easy to make, prepare and ready from scratch in 5 days or so. They make a fantastic snack anytime of the day whilst making a great addition to a breakfast, picnic, or lunchbox. Have fun by choosing different varieties of apples and even by getting the children involved in the process. Perfect for half term and if made in bulk this fantastic and extremely healthy treat will see you through the summer holidays. Ensure the apples you use are blemish and bruise free, this will ensure they last longer once dried. Into a large bowl of cold water, half and squeeze in the juice from a whole large lemon. Drop the two lemon halves into the bowl of water. This acidity from the lemon will stop the apple slices from discolouring. Core each apple and slice width ways into thin slices, approx. 3mm thick. Ensuring they have a perfect central hole. Place each slice into the bowl of water and allow them to soak for at least one hour. Once all of the apples have had a good soak in the lemony water, drain them and pat each slice dry with a few sheets of kitchen towel. 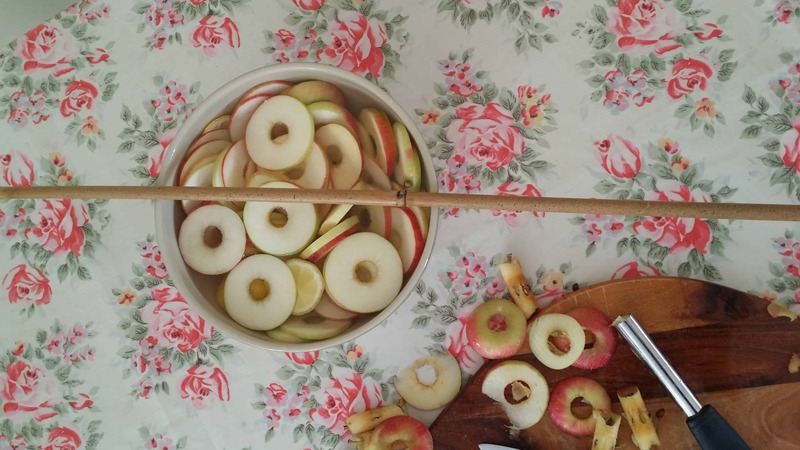 Feed each apple slice onto the prepared and oiled garden canes, ensuring you leave a little space between each slice to allow the air to circulate and prop the canes somewhere safe in your house to air-dry for 4-5 days or so. Carmela is a mother to four bambini and a passionate cookery teacher, demonstrator and food writer. Cooking simple, inexpensive, flavoursome food using good quality seasonal ingredients is her mantra. The most basic and mouth-watering of Italian dishes can take minutes, from an easy spaghetti dish to a slow cooked meat sugo. Pasta Evangelists celebrating London Pride!